Hope you are having a good Sunday. Mine is going great. I have been playing with an idea I had in my mind from some time and never had the nerve to take into action. 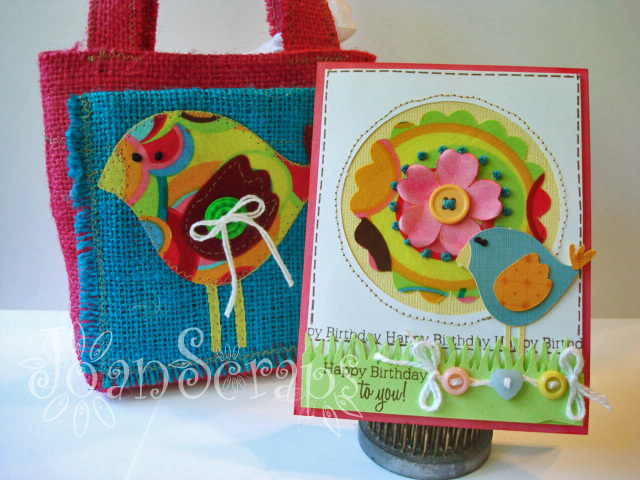 I have been imagining from some time a gift bag decorated with fabric appliques and a coordinating card and tag. The girls at CPT gave me the final push I needed to bring this idea to life. First of all this is the Inspirational pic at the first ever challenge at CTP - Color My Week #1. I could only feel joy cooking in that kitchen. This is the gift bag. 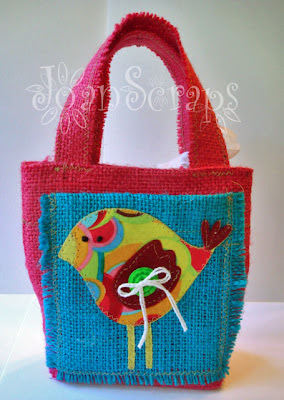 It's made of fuschia and teal burlap and printed cotton fabric. I cut the cute bird with my digital cutter adding some Heat and Bond Ultrahold backing for stability. It has the perfect size to carry some snacks to work. This is the coordinating card. 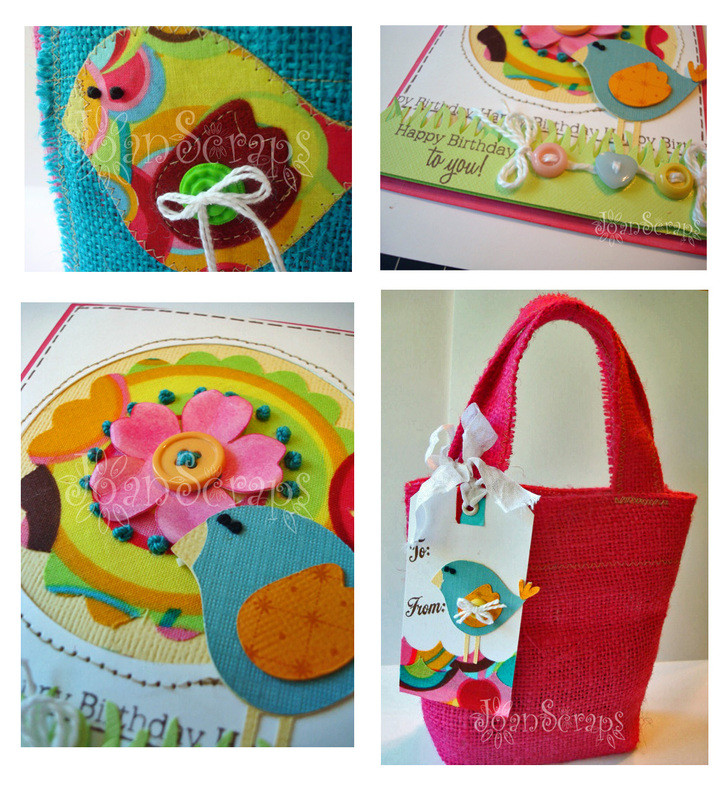 It has a fabric flower to coordinate with the bag. 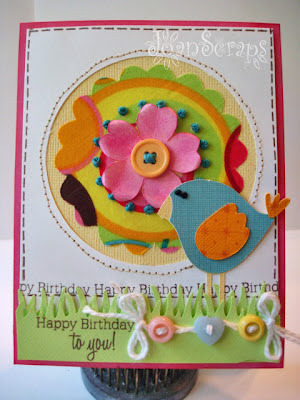 I used the same bird file in a smaller scale to make cuts in paper for the tag and card. I love the fact that I can make the same cuts in fabric and paper. Imagine the possibilities!!! - I made the green button used for the bird in the bag with Polymer Clay. with some brown stitches and the sentiment. IT WAS HIDEOUS!!! - The eyelet in the tag is the first eyelet I use in more that two years. 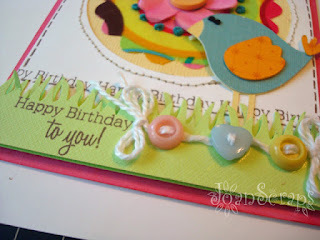 - I just realized how easy is to make tags from scraps. I have to start making a lot!! OK, now I have to get back to reality and keep doing the laundry. Off to my housewife duties, they are boring but still someone has to do it!!! Love this set! Amazing and fits our CPT Challenge perfectly. Thank you for joining in! U r fast, girl!!! Súper bello todo...obviamente, el botón me fascina! :) Gracias por participar en el primer reto de CPT! Love that you pulled the bright lemony yellows and happy colors from this kitchen photo! Adorable project ~ thanks for joining in the fun at CPT!!! How cute, colorful and HAPPY!! And yes...I CAN see the bright colors in the photo! 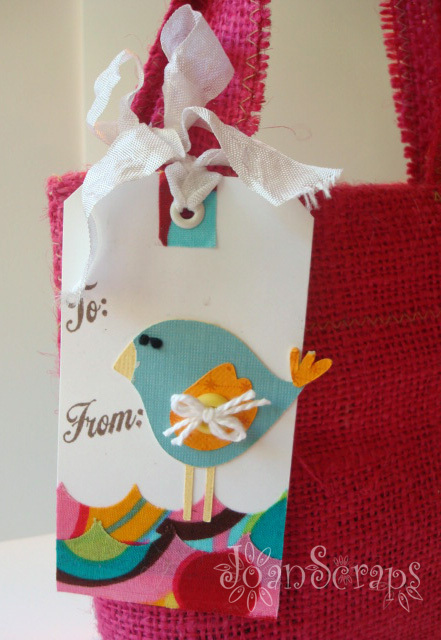 I love burlap but don't own it in any of those gorgeous colors! And, if you saw my project, you KNOW I love your little birdie!! Just LOVE what you've done here, and am SO happy you played along with us! Thanks for YOUR inspiration!! Te quedo bello!!! Me encantaron esos colores y los pajaritos estan bien chulos! Gracias por compartir! Tremendo trabajo! Todo muy colorido, te felicito. Me encanto este proyecto tan lindo y curioso. La combinación de colores, Fabulosa !!!! Hermoso set! colorido y adorable!